Charles DeGaulle once asked how could it be possible for anyone to govern a country that has 247 varieties of cheese. Back in the day, it was a treat to sample artisan fromages of all kinds and ponder a suitable wine to accompany them. 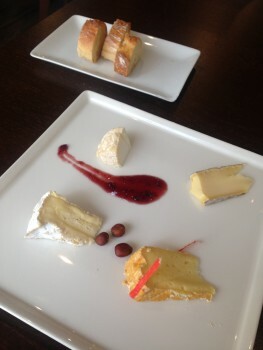 Now, alas, I am becoming somewhat concerned about the state of French cheeseboards. As I travel around the country, I observe that interesting regional varieties are becoming increasingly marginalised in favour of the omnipresent Camembert. Several years ago in the old docks in Marseilles – on the other side of France – there it was as the main ingredient of a ‘plateau de fromages’. Sacré bleu! Where were the cheeses of the deep south? More recently in Limoges the old chalky white favourite made an appearance again and the waiter gazed at me blankly when I asked if he had anything from the Centre. Could it be health and safety, might chefs be running scared of unpasteurised choices, are French diners worried about their waistlines? Now Camembert has its place, of course, along with Livarot and my pick of the crop, Pont-l’Évêque. That place is Normandy. My picture shows a fine selection from the up and coming Granville restaurant L’Edulis, expertly run by Jonathan Datin and I have no complaints. But I don’t travel to the Côte d’Azur to eat it. And it’s not just cheese. I’m an old fashioned soul at heart and it’s dispiriting to see so many French towns becoming swamped by chain stores. Plucky independent shopkeepers are being forced out by the likes of bakery La Mie Caline and global clothes store Benetton. It was the last straw for me in Granville last weekend when I spotted Superdry in the town centre and Buffalo Grill on the outskirts. I have a feeling I know what Monsieur DeGaulle would say?